It’s official! 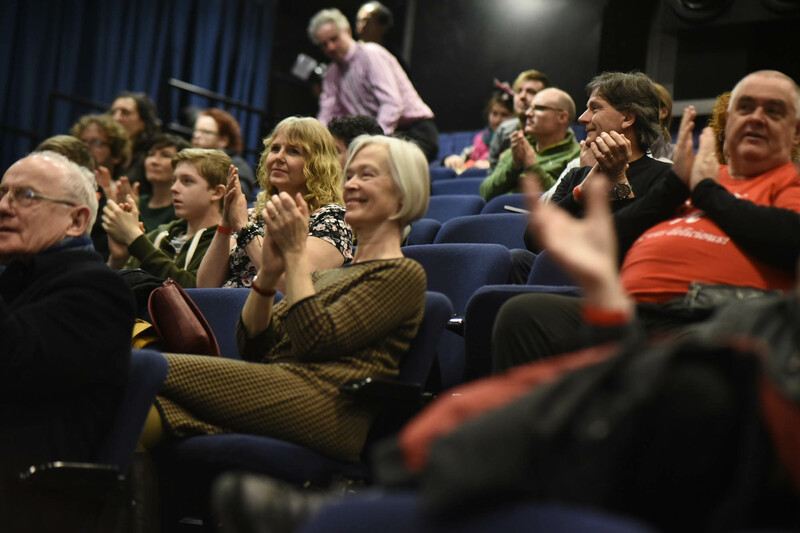 Brighton Science Festival was a lot of fun. Andrea Sella, Viki Bloodworth and I had a vast range of props, slides, demonstrations and experiments lined up to explore just a few of the things where science and cycling meet. 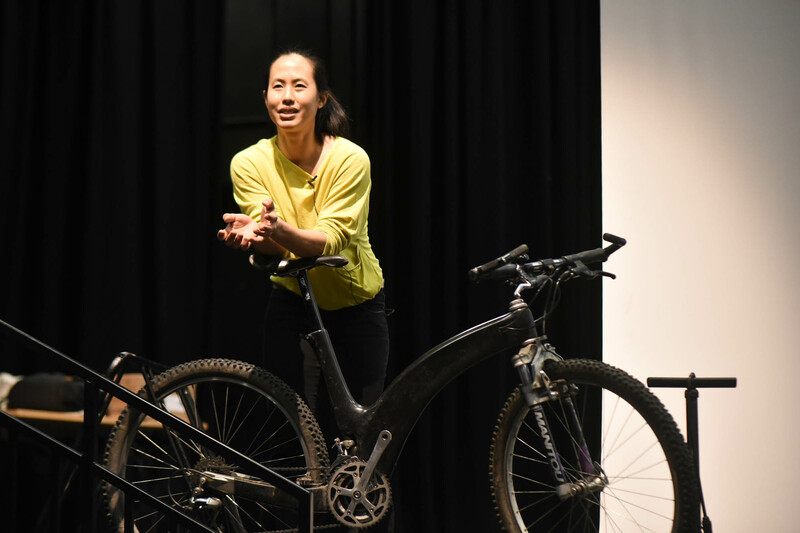 Viki brought the rare and beautiful Lotus MTB, the monocoque carbon fibre bike designed by Chris Hornzee-Jones of Aerotrope. The finer points of carbon fibre were explored – plus some insights into the extraordinary new developments coming to a man-made composite near you any day soon. Forty-three years after Eddie Merckx had a special request turned down by Ernesto Colnago, Andrea demonstrated in public, for the first time in recorded history, how the great cyclist could’ve saved 10g from his bike by filling his tyres with hydrogen. It was a gas. 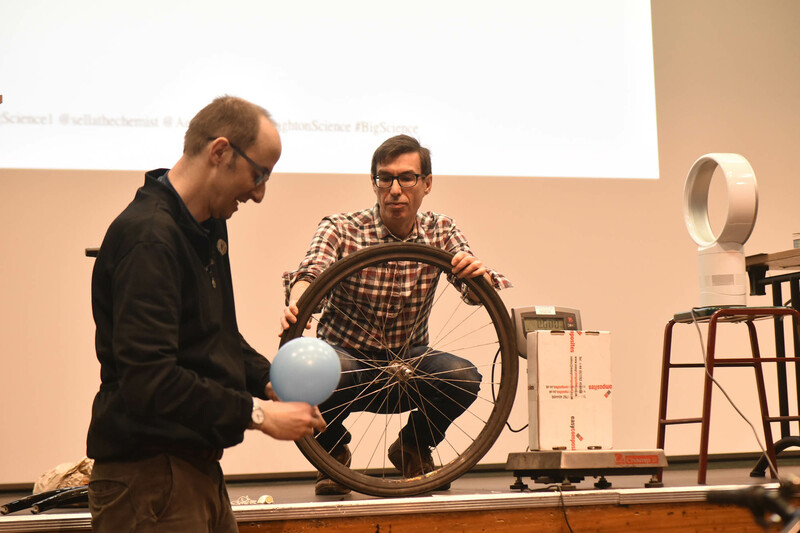 Thanks to EasyComposites, which kindly donated materials, the audience was able to visualise how much bloomin’ air a cyclist has to push aside just to pedal down the road. The instant scale model wind tunnel, powered by Dyson, made apparent the vortex that hides behind every saddle and saps our energies just a little. Some of this, and more, will be happening again next month. At the Edinburgh International Science Festival, at 5.30pm on Sunday 12 April, Andrea and I will be joined by Ashleigh Fraser, Scottish National Junior Women’s Road Race Champion. She’ll put us amateurs in our places as she reveals the true science of being best on a bike. I’ll lead a public cycling science ride in the centre of Chester, complete with demos and experiments. In the evening I’ll be explaining How to Cycle over the Greater Himalayas by Accident. On purpose. This entry was posted on 17/03/2015 at 7:27 pm and is filed under Uncategorized. You can follow any responses to this entry through the RSS 2.0 feed. You can leave a response, or trackback from your own site.